To be trackside in the Corridor in VIA’s early era was a colourful cornucopia of sights and sounds. At the time, the continuation of operations from the CN into the VIA era provided many of the same sounds but some new sights. At Kingston, time spent on the platform revealed VIA blue & yellow making inroads into CN’s black & white scheme. Platform-filling consists prevailed, with baggage cars, meal service cars, coaches, club cars and even the occasional CN business car tagging along. Positioning oneself to see the approaching consists in review, inevitably ending up next to the locomotives, each consist could be viewed twice. Bell ringing, the train would be halted at the ‘pheeeep’ of the air whistle in the cab. Brakes squealed and running gear clunked and groaned. Locomotives would be brought to idle, coach Dutch doors opened, and stepboxes would be dropped onto the platform. Handrails wiped, suitcases and babies lifted from vestibule height to platform height by trainmen and conductors, baggage wrangled by the baggageman before returning to his wooden stool in the baggage car. Rising and falling, MLW 251’s burbled continuously. GMDL 567’s had a drumming idle. Though serendipity sometimes prevailed providing solid MLW or GMDL locomotive consists, mixing together of both makers’ models was liberal. Some enginemen would roll down the window to converse with us ‘train buffs’ while other crews would busy themselves with various cab duties, or simply stare grimly ahead! The highball from the conductor was soon followed by the ‘pheep pheep’ on the air whistle, often answered by a ‘barp barp’ of the air horn. A tug on the coupler. Bell ringing once more, smoke-belching MLW’s and the chant of transitioning GMDL’s rising to a crescendo, co-conspirators in a cacophony of sound and smoke sent skyward. Wheels banged on rail joints prior to the advent of continuous welded rail. Faces looking out - listless coach passengers, comfortable club car patrons, convivial comrades in the ‘bar car’. Prior to tinted glass, the panoply of passengers went past, continuing on their voyages. Soon it was just the last vestibule door, marker lamps and sometimes the hot breath of escaping steam as the train pulled away. 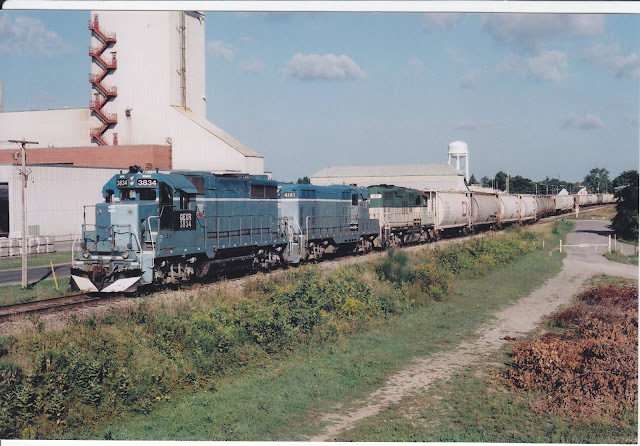 I should also mention that Eric has also written Trains & Grain Volume I and II, which detail his time trackside with Canada's iconic grain trains. Those books are also available through the Grains and Trains blog. I should also mention that shipping to anywhere in Canada is included in the prices. You can contact Eric directly at mile179kingston@yahoo.ca. 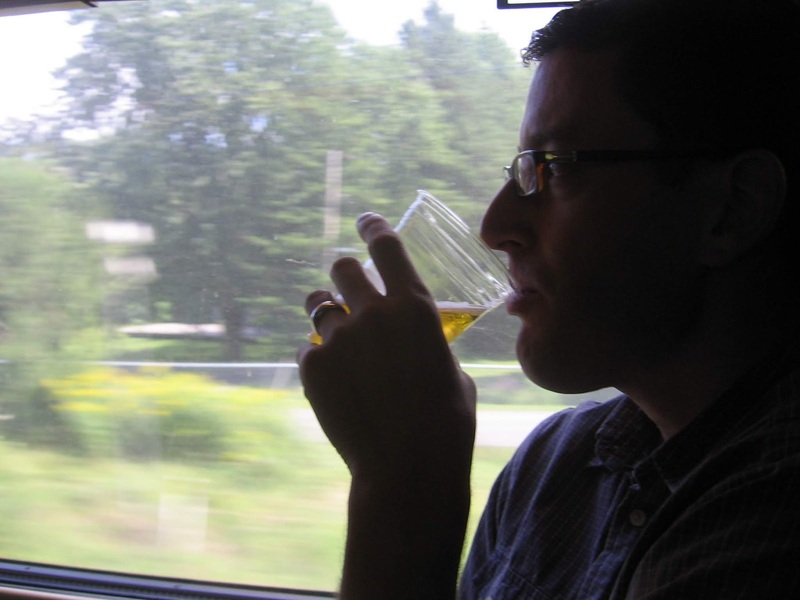 This week marks the third and final installment of my favourite Via Rail memories from my lifetimes either riding the train or standing trackside. You can read the first post here and the second post here. I would love to hear some of your favourite Via Rail memories out there as well. 21. In the early 1990s, my sister went away to university in Waterloo. As is the case with many students, the train becomes the primary source of transportation when your hometown is more than a few hours away. One of the benefits to my sister being away from school was that she often would arrive home for visits in an Amtrak train, which was an exotic site, even in a border town like Sarnia. The reason why she would often come home in an Amtrak consist was that Via and Amtrak still operated their Toronto-Chicago service, which would involve Amtrak trains operating between Sarnia and Toronto with Via Rail crews aboard. I was lucky enough to capture one of those trains shortly before Amtrak ditched its F40s in favour of its ubiquitous and impossibly ugly fleet of P40s and P42s. 22. 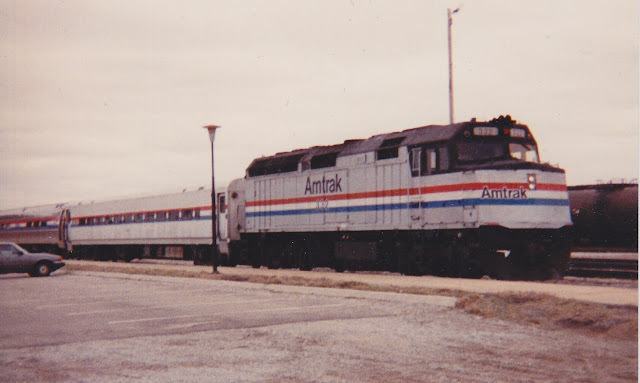 Staying with Amtrak, I once had the pleasure of boarding one of those Amtrak trains with Via crew in Sarnia when I boarded a train for Kitchener to visit my sister for the weekend when she was away at school. Cooler still, the train I was riding featured Amtrak Superliners. This was only possible shortly after the new St. Clair River railway tunnel was completed beneath Port Huron, Michigan and Sarnia. Up until that point, the old tunnel could not accommodate Superliners, autoracks or double stack container cars. Not many people can claim to have taken the Superliners from Sarnia. The international service between Chicago and Toronto was terminated in 2004. 23. Once in a while, you capture magic. I am by no means an expert at photography. And to be honest, I don’t often go trackside to capture Via Rail corridor trains these days, because I have so many shots of them already. But on this day after a snowfall, I captured this image near Cedarview Road that ranks among my favourite railway photos. 24. When I was young, my grandparents would sometimes travel to their hometowns in Eastern Quebec (Le Bic and Padoue) via the formerly branded Chaleur. One weekend they had a surprise for me. It was a full-size Via Rail Chaleur poster with a stunning image of a Via blue and yellow F unit pulling a string of silver Budd coaches across a bridge somewhere in Eastern Quebec. Sadly, that poster has been lost to time. Does anyone remember a time when you could buy Via Rail branded posters? Am I dating myself right now? 25. I remember passing endless hours playing with those LRC cardboard trains that you can still get on a Via Rail train. Whenever someone in my family rode the train, they would usually bring home a small cardboard train for me. I was happy to hear that Via Rail still gives those away on the train. A nice touch. 26. Perhaps my greatest Via Rail memory was when I had my one and only encounter with the legendary Canadian at Banff station. 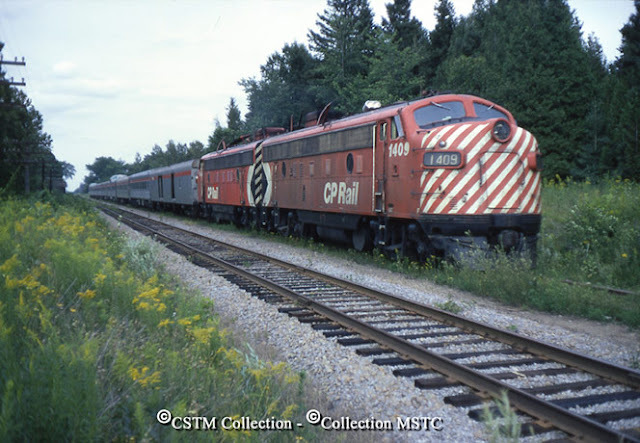 It was the summer of 1986 and the train had just staggered into the station, being led by a CP Rail SD40-2. Obviously, the F units pulling the train had run into trouble somewhere between Vancouver and Alberta. My family was visiting our extended family at the time and someone (I’m not sure who) convinced the CP Rail engineer to let my brother and I climb on board that mammoth machine. The engineer, Rick, was nice enough to show us the basics of the engine, including what he called “the robot,” which made no sense to me at the time. Somewhere in my family archives are photos of that encounter, including a shot of my brother and me on the walkway of the SD40-2. There is also a shot of the full consist. I have been bugging my siblings to search for them, but no one has been able to locate them. I once had copies of these photos but those images have long been lost. Sigh. 27. I’m trying to remember how I ended up getting this shot, which was taken somewhere near the Moodie Drive crossing. There’s nothing spectacular about this image, but I have always liked it for some reason and have ranked it among my favourite Via Rail shots. 28. Once in a while, you see something odd at Ottawa Station. I always love it when I catch something odd. This consist might be one of my all-time favourites. I love the weird rainbow consists. 29. Many people didn’t like the Canada 150 wraps, but I thought it made for a fun year trackside. This was the first time I captured a wrap. 30. I am dating myself again, but I remember being able to go to the “snack car” when I was aboard a Via Rail train between Sarnia and Quebec City. It was when my family went to Quebec City in the summer of 1983. To a young railfan, being able to get up and walk through a moving train was the pinnacle of adventure. So those are the Via Rail memories, both distant and recent, that stand out to me. Although the company often finds itself the target of criticism and funding constraints, I think we should all be very proud of this service. I only hope that, one day, its political masters will build the railway back up to the national carrier it should be. Stay tuned for a bonus Part IV of this series, featuring a guest blogger. To honour Via Rail Canada’s 40th anniversary, I am sharing some of my favourite Via Rail memories from my numerous adventures along the Quebec City-Windsor corridor. Last week, I shared my first 10 memories. Here are ten more. 11. It’s been three years since I last took the train. The last time I was on a Via Rail train was in 2015 when I had to go to Montreal for an appointment. The reason this memory sticks out is that it was the first time I had been away from my young family (my oldest daughter was three at the time when my youngest was nine months). As much as I missed my family, it was such a peaceful day! That day afforded me many rail memories, which you can read about here and here. 12. This is not really my memory, per se, but a story that was related to me by someone who used to work as part of Via Rail’s staff at Union Station in Toronto. I won’t get into too many details, to protect the innocent, but this was the story that was told to me. My contact was part of a crew whose duties included loading baggage cars and helping people on the platform in the train shed. One day, a few employees were bringing a casket to a baggage car so it could be transported somewhere for a funeral or memorial service. For whatever reason, something went horribly wrong and the casket tumbled from the platform onto the tracks, body included, obviously. I can’t imagine how this would be explained to a supervisor. I also can’t imagine the process of fixing this situation. 13. In 2010, a few days after I married the love of my life, my wife and I boarded a train from Ottawa to Quebec City for our honeymoon. For years, I had been saving Air Miles with no particular end goal in mind. One of my main responsibilities in the lead-up to my wedding was the plan the honeymoon. In a stroke of genius, I redeemed all my Air Miles and brought Via Rail gift cards, which I then used to purchase two round-trip first class tickets to Quebec City. 14. 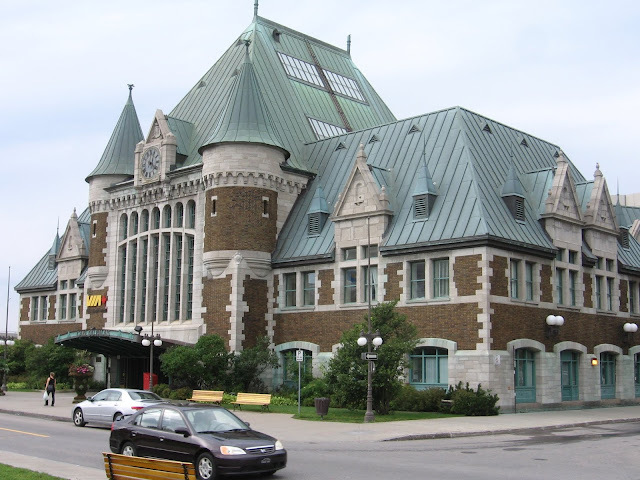 Arriving at the Quebec City train station, both as a child and then as an adult on my honeymoon. This station is one of the best railway stations, period. You don’t forget your initial experiences in this place. It is a jewel. 15. One of my favourite stretches of track to travel is the (now) Goderich Exeter Railway line through St. Mary’s, Ontario. The first few times riding this stretch of railway still evoke fond memories. This town is still served by Via Rail. When you come into town on the Sarnia Bridge over the Thames River, you feel as though you have been transported back in time. The pastoral view evokes memories of a bygone era, when idyllic small towns owed their existence to the railway. Four daily trains still serve this town. 16. That time when I wanted to capture some dramatic winter railroading shots at Ottawa Station and I came away with these dramatic images, thanks to a wind storm. 17. When my second daughter came into the world, she didn’t like me all that much, which was not surprising. However, when my wife went to work and baby had to spend time with me, I decided that a car ride would calm her down. I was right. That began a few months of wonderful jaunts through the countryside in west Ottawa looking for photo opportunities along the Smiths Falls subdivision. This might be my favourite shot from that time. 18. When I started getting a little more adventurous with my railway photos, I came across this stretch of McKenna Casey Drive in Ottawa’s west end. I captured this shot of a Via Rail corridor train while a summer storm barrelled into town from the south. 19. My sister spent a summer working in Banff and I was lucky enough to be able to go visit her. She was nice enough to take me to Banff station, where I did some ridiculously cool railfanning, which you can read about here and here. 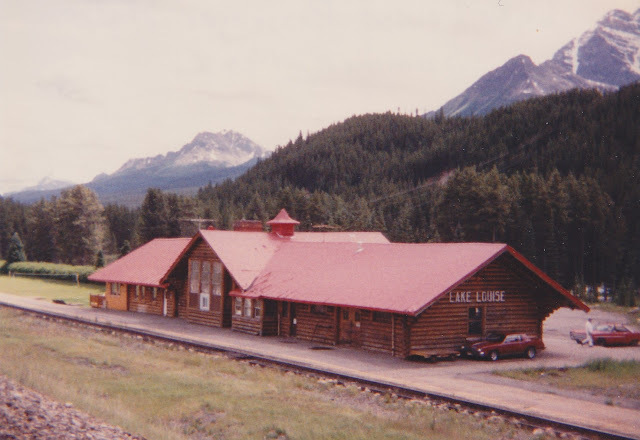 Also, over the course of our adventures, we were able to check out the old Lake Louise passenger station, when it was still in service. We didn’t see any trains when we were there, but that station might be one of the best in Western Canada. It’s too bad the Canadian doesn’t call there anymore. 20. The first time I took my oldest daughter with me to the train station, in this case Fallowfield, her lasting memory of the experience was not at all what I expected. I sat her down trackside and tried to teach her a few things about rail safety. I took a short video and the engineer was nice enough to wave at Sarah and her foamer dad. But, my daughter was much more fascinated with a crow that was craning its neck sideways to drink out of a meager puddle in the parking lot. She still talks about it. Sigh. I guess the railfan gene might have skipped a generation. Via Rail Canada’s 40th anniversary had me thinking back to all my memorable moments on the train. 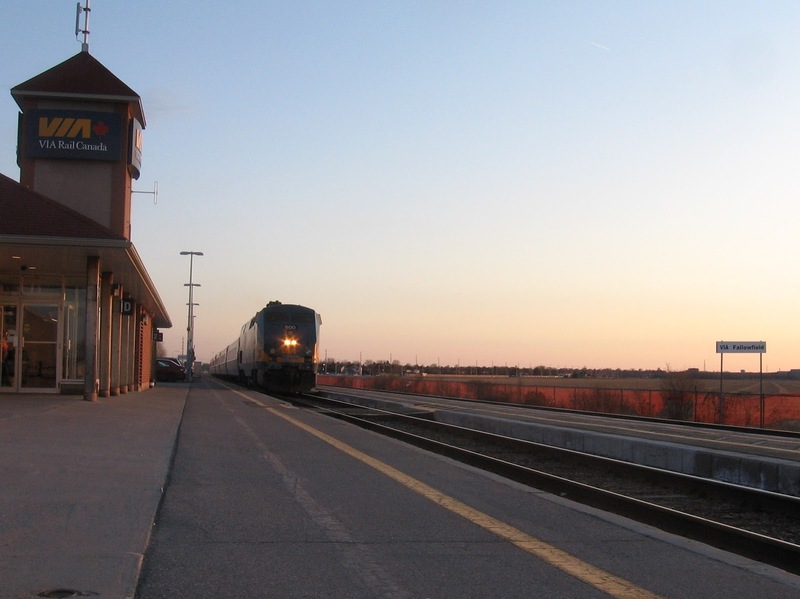 Like many others, many of my experiences on the train are tied to family trips and travelling between my hometown in Southern Ontario and university in Ottawa. I encourage anyone else out there to maybe share a few Via memories of your own. As much as people complain about our national passenger railway, I think the railway deserves a great deal of praise for continuing to provide an excellent service despite being at the mercy of its various political masters over the years. So, without further ado, here is the first installment of my 30 Via 40 memories. Let’s start with the first 10 memories, in random order. 1. My first ride aboard Via Rail was when my family took a short trip from Sarnia to London because my father had some appointment in downtown London. 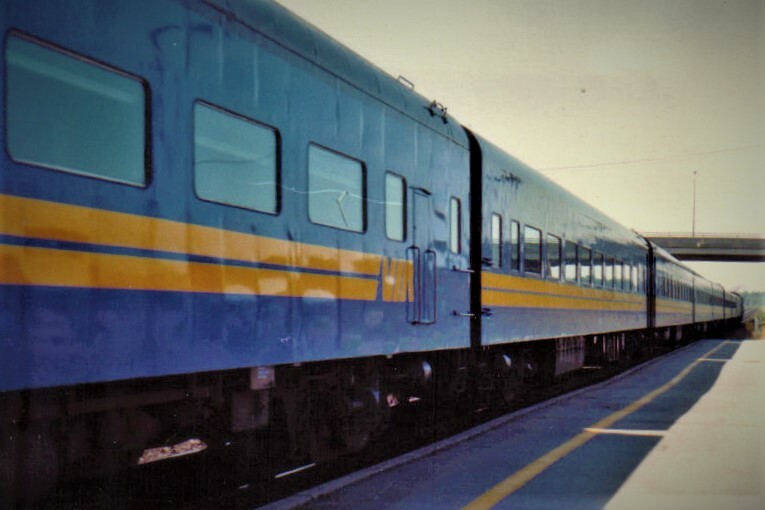 I was very young but I have a vague recollection that we were in an old Via Rail blue and yellow coach on a sunny morning. I also remember getting off the train at the old London station and getting into a yellow taxi cab for the first time in my young life. For a kid from a town of 6,000, seeing a “big” city and travelling on a train was about as much excitement as I could handle. This trip was very likely circa 1983-84. 2. I am lucky that I was able to catch the tail end of Via’s rainbow years, when there were was a variety of equipment in use. I recall the first time I saw a Via Rail train in the wild, as it were. The train was an all-blue consist, with an old F unit on point. We were stopped at the Bloomfield Road level crossing in Chatham, as we were making our way to Windsor to visit my grandparents. The train was heading east toward London. I don’t know why this moment sticks out in my mind, but it could not have been any later than 1983. Even to this day, my favourite piece of railway motive power is any F unit. I guess for me, they would hold the same fascination that steam holds for older generations. 3. 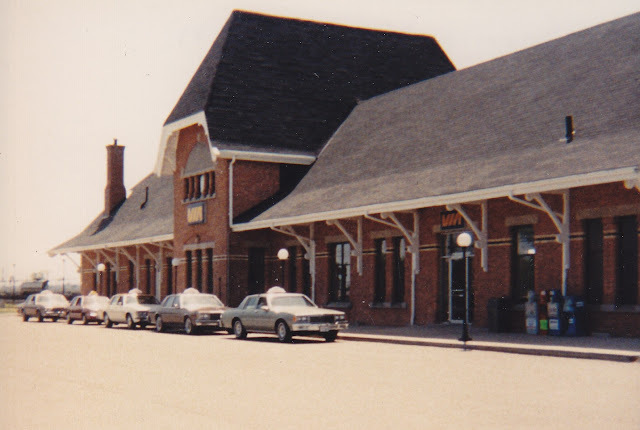 In 1983 (this time, I know it was 1983), my family was taking the train from Sarnia all the way to Quebec City on the train for a family vacation. 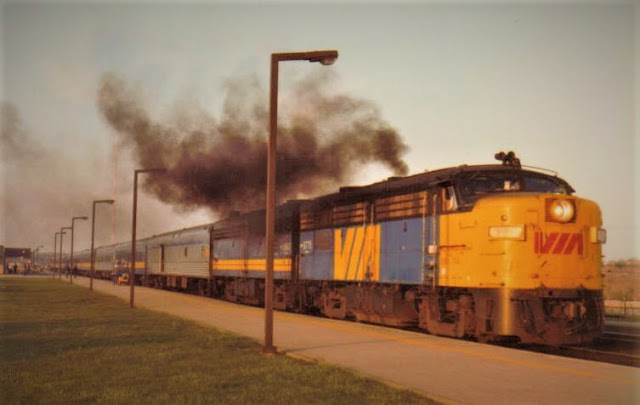 I have a number of memories from that time, including sleeping on the seats of an old blue and yellow coach as the train made its way overnight into Quebec. There can’t be a much more Canadian experience than this. My mom told me I fell asleep for six hours on one of those seats. I could never do that today. 4. During that same trip, I remember my brother and I walking the platforms as we were getting on to our train at Toronto’s Union Station. We spotted an old CN black-and-white consist on the platform. At the time, I had never seen any passenger equipment in anything but the familiar Via Rail blue and yellow. It would be years before I realized that Via hadn’t always just been around. The sight of those old CN black and white coaches made me a little bit jealous. I wanted to be on board that train, I told my brother. I was intensely curious. 5. Skipping ahead many years, I remember bringing my now departed dog Tessie to the Fallowfield train station in 2011, to pick up my wife who was returning home from a conference in Toronto. At the time, my wife was pregnant with our first daughter and my dog had never been apart from her, which was a bit traumatic for the dog, since my wife works from home. Well, I thought it would be a nice surprise for my wife, but it turns out that the sound and thunder of the approaching train scared my dog (a small schnauzer) half to death. But, all was well, when my wife emerged from the train and my dog saw her favourite person in the world. 6. One time on my way home from university in Ottawa, there was a great deal of commotion behind my seat. I turned around to see a flurry of well-wishers shaking hands with Walter Gretzky, who was heading home as well. 7. In 1998, I was aboard one of the very last Via Rail trains to make it into Ottawa before the ice storm essentially shut down everything in Eastern Ontario and West Quebec. 8. In October 1996, I took the train home for Thanksgiving weekend, after being away at university for the first time in my life. I arrived at Sarnia station pretty late after a long day in transit. My brother was on the station platform waiting for me. I remember him jumping up to see where I was. It’s always good to have that type of homecoming. 9. The first time I had one of those “Where am I?” moments was on one of my first trips aboard a Via Rail train to Ottawa. The train stopped at Ganonoque Station. I looked around and essentially saw nothing. Anyone who has travelled in this area knows this station is in a pretty isolated location. That was when I wondered what kind of one-horse town Ganonoque was. Of course, appearances can be deceiving. Ganononque is actually a really cool little town along the water. You just wouldn’t know it from the station. 10. I am going to date myself here, but I remember when you could still smoke on a train. As part of my family’s trip to Montreal (again, this was early 1980s), half of our LRC car was designated as smoking. I remember a very animated group at the opposite end of our car carrying on a lively conversation in French. My mom and dad were not impressed. It was only later that I discovered that the group was actually telling a bunch of dirty jokes. As several local rail enthusiasts have noted in recent weeks, Canadian National has listed all of its Ottawa-related trackage on its three-year abandonment list. That includes the entire Alexandria Sub, the section of the Smiths Falls Sub where is operates with running rights from Via Rail, one mile of the old M&O, its Vankleek Spur, L’Orignal Spur, its connections to Walkley Yard and the last remnants of the Beachburg Sub. Here's a link to the CN page, where you can find the PDF report. What does this mean? Well, it’s anyone’s guess what will happen, but it’s obvious that CN no longer wants to foot the bill to maintain what little trackage it does own in the Ottawa area, not to mention in Eastern Ontario (not including its Kingston Subdivision main line through Prescott). There are many possible scenarios and consequences at play here, depending on what does happen. No doubt, CN will argue its operations in this area are no longer viable to its bottom line, which is probably fairly accurate, given the scale of the operation and the massive overall structure of the company itself. This is how I see it, from my limited knowledge of CN and railways in general. 1. CN will sell what little trackage it owns on the Alexandria Sub/Smiths Falls Sub corridor to Via Rail. There is no question this will happen. On its abandonment list, it’s not clear to me if CN owns any of this trackage anymore. Someone with more information than me can fill me in. It is listed with an operating rights designation, which likely means it's not theirs. 2. Depending on what’s left to be sold off and what CN still owns in the city, is there a chance CN would continue operating freight services here on a strict running-rights basis? I don’t think so, but I’m raising the point for someone who knows more than me. If CN doesn't own much of anything, it would make no sense to continue on a running rights basis. We can only hope that someone as professional as Mr. Allen would step in and refocus all local efforts from a more effective shortline mindset. Ottawa will never again be a freight railway hotbed. 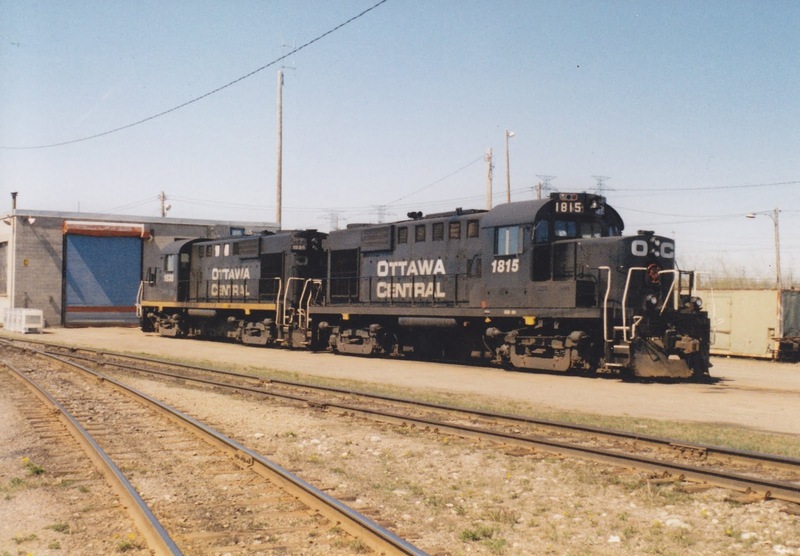 But, Ottawa Central’s success from 1998–2008 is proof that a freight railway can succeed here. If CN does indeed pull out, the question becomes who steps in? Is there an existing shortline company or company along the lines of Genesee & Wyoming (G&W's Goderich-Exeter Railway seen below near Mitchell, Ont.) that would be interested in Ottawa? It all depends on what is actually left and what new business could possibly be attracted. 4. If a shortline does step in, then the question of what to do with Walkley Yard becomes a moot point, although I’m guessing a number of interested parties would be watching this situation carefully, including OC Transpo, which uses a portion of the yard as a maintenance facilities for its fleet of Alstom diesel light rail trainsets that ply the Trillium Line. That line, as you know, will be extended as part of the second phase of the city's LRT expansion. 5. This development causes another headache to one of CN’s sole remaining customers in the west end, Nylene Canada, in Arnprior. This company has stated in the past that it has to have its caprolactum delivered via insulated tank car, given the nature of the substance. Trucking is not an option. A shortline would no doubt continue its weekly deliveries to Arnprior, but the company must still be uneasy. It’s hard to see CN’s pending departure from Ottawa as anything but inevitable. I once tended to agree with those who stated at the outset that CN was only interested in OCR for the scrap value of the Beachburg Sub from Nepean Junction to Pembroke. That’s a lot of rail, worth tens of millions of dollars that it was able to retrieve and use elsewhere on its system. And I’m not mentioning the other assorted pieces of track it has removed in the last several years in and around Ottawa. But, given that CN has operating in Ottawa for 10 years now that argument doesn’t seem to hold up. If the company was only interested in rails only, then why would it stay in Ottawa so long? Maybe the opposition from Renfrew County and the Pontiac Region in Quebec held up its plans for the Beachburg Sub longer than it would have liked. Maybe the OCR acquisition was something CN had to shoulder as part of its purchase of the entire Quebec Rail Corp. portfolio in 2008. As a railfan and major proponent of regional commuter rail, I’m hopeful that a shortline operator can step in and make a profit here. From a very selfish point-of-view, it would great to see more than one train a week on the railway tracks going through my neighbourhood. I wasn’t at all surprised with the results of the Ottawa municipal election. In the absence of any real challenger, our mayor was re-elected for a third term. In the aftermath of the election, there were a few comments that I found quite interesting, especially when it comes to the issue of commuter rail in Eastern Ontario. For now, the Beachburg Sub will remain largely lifeless. Although some think a regional commuter system along the lines of GO Transit is inevitable on this line. 1. Although Clive Doucet lost the mayoral race handily, he is earning some plaudits for raising the possibility of regional rail for Eastern Ontario. Although I often did not find myself agreeing with Doucet when he was a city councillor, I agree with his regional rail idea. After the election, he said he was confident that Ottawa will see regional rail, along the lines of the GO Train in the Toronto area. His point was simple. Given that the Ottawa-Gatineau area now boasts more than 1.3 million people, the area is now probably big enough to sustain some form of commuter rail operation. I’m not sure if Doucet made those comments based on something he knows, but I like that he said it. I am less optimistic. I don’t see any regional rail champion in Ottawa. Everyone is aboard the LRT bandwagon, as flawed as it is. 2. For months, I’ve been trying to figure out what it is about the city’s LRT plan that bothers me. Doucet, to his credit, made this simple observation during the campaign that sums up what I feel. Phase I is too short. I have often remarked on this blog that emptying out Ottawa’s eastern suburban commuters at Blair Station and its western suburbs at Tunney’s Pasture really doesn’t benefit anyone in the short term. It only adds another step, and likely time, to my morning commute. It does nothing to take buses off the roads in the suburbs. So who does Phase I benefit? The downtown and the communities in and around the core like Westboro, Hintonburg, Wellington West, Vanier and Sandy Hill. The LRT will take the express commuter buses off the roads in those neighbourhoods, but it does nothing for massive communities like Kanata, Orleans and Barrhaven in the short term. Considering how many delays there have been with the first phase of the Confederation Line, it seems to me that it might have been a better idea to take several more years and combine Phase I and II together. At least then, the new LRT line would connect Orleans in the east and Moodie Drive in the west. I'm not sure if it will take $25 million to reconnect the Trillium Line with the Prince of Wales Bridge, but it seems like a little foresight could have prevented the future costs. 3. It emerged during the mayoral race that it will likely require $40 million to rehabilitate the Prince of Wales Bridge to make it fit for trains again. Doucet’s campaign also estimated that reconnecting the trackage over the Ottawa River to the existing O-Train Trillium Line would cost $25 million. I’m not sure where they came up with that figure, but it seems high to me. However, I think the larger point here is that the city will have to pay dearly for its lack of foresight on this strategic rail asset that it has owned and neglected for years. 4. Surprisingly, amid the debate over commuter rail during the election campaign, there was very little said about the Moose Consortium, which has been fighting with the city over its neglect of the bridge and the connection of the bridge’s rails to the Trillium Line. You will recall that Moose won an important victory over the city not too long ago, which had forced the city to scramble. 5. One point that Doucet made during the campaign that really struck me as brilliant was his point about the viability of a regional rail system. While Watson’s camp dismissed Doucet’s plan constantly, Doucet raised the point that thousands of commuters from outlying communities like Limoges, Smiths Falls, Chelsea, Wakefield, Kemptville and Arnprior all make their way into Ottawa each day and chew up our roads, without having to pay for their maintenance. While it’s true that a regional rail system would require a substantial subsidy from all the municipalities involved, is it not better to get these cars off the roads and get these commuters paying some sort of fare to ride a train to work? At least under this system, we would be getting some sort of compensation from those who make their way into Ottawa whereas now, we get nothing. 6. Parts of Doucet’s plans called for commuter rail to parts of Kanata North, which would have been a good idea several years ago when the city had the chance to buy a small portion of the old CN Beachburg Subdivision. Sadly, nothing happened and those rails are gone. I feel bad for residents of Kanata. All this spending on light rail and they will see no benefits whatsoever for many years still. Their only hope might be some sort of connection via the old Renfrew Sub near March Road. It was an interesting mayoral race, which had me agreeing with politicians I have never agreed with in the past. I would really like to believe Mr. Doucet that regional rail is an idea whose time has come, but I think we are now stuck with four more years of leadership that truly has no understanding of railway policy. Well, it seems we weren’t the only ones who were wondering what Mayoral candidate Clive Doucet had in mind when he outlined his regional rail transit plan, which seemed to indicate that Stittsville would be served by the old CP Carleton Place Subdivision. Stittsville Central took a look at the same map we did and wondered whether Mr. Doucet indeed intends to connect the exploding western suburb via the old CP line, which is now part of the Trans Canada Trail. It turns out, that the old CP line between Bells Corners and Stittsville will remain a trail. In response to Stittsville Central’s question, Mr. Doucet’s campaign has suggested that Stittsville be served via a connection to Kinburn via the Renfrew Spur rail line. This also seems to solve a similar geographical issue in the city’s east end, where Vars and Navan are connected via a non-existent rail line. Getting back to Stittsville, I have to say that I don’t see the logic to suggesting Stittsville will be served by a connection in Kinburn. Any quick look at a map of Ottawa’s west end will know that Kinburn is by no means a neighbour to Stittsville, since it is closer to Carp. That begs the question why the Doucet campaign would link Stittsville with Kinburn. Of course, it’s politically convenient to suggest to Stittsville residents that they will be first in line to be connected to a regional rail system, but a connection via Kinburn makes little sense, since it’s not exactly located between Stittsville and downtown Ottawa, which would make the most sense to a commuter. 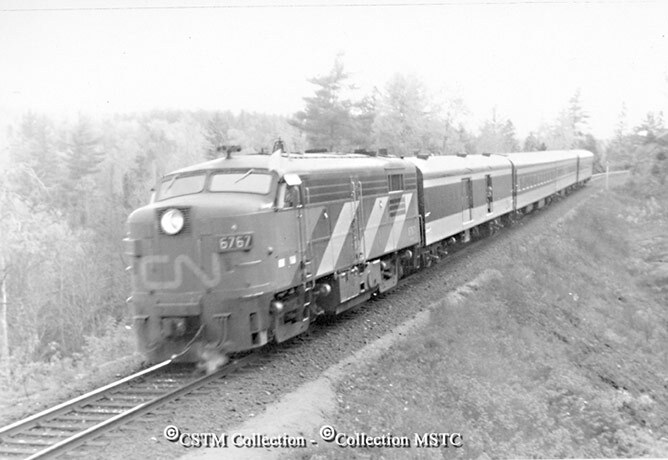 If anyone is expecting passenger rail to return to Stittsville via the old Carleton Place Sub, think again. Plans to connect the suburb do not include this old rail line, pictured in 1972 when it hosted CP Rail's Canadian. In a radio interview this week, Mr. Doucet also backed off some of his planning for regional rail connections in Gatineau. His map shows connections as far away as Chelsea, which would require a rail line be re-established on the old CP Maniwaki Sub. Mr. Doucet said the regional system will go as far as Place du Portage in downtown Hull. Since I now work in downtown Hull, I can say that the terminus will be much more likely be Terraces de la Chaudière, which is not the same as Place du Portage. 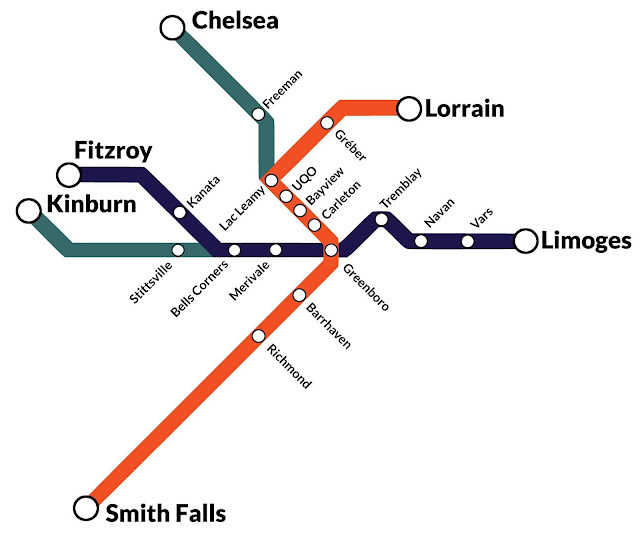 This is about as far as Clive Doucet's regional rail will go, according to his latest comments. The brown buildings on the left are realistically the end point of his Quebec connection. This is all academic, of course. I would be shocked if Mr. Doucet was all that close to incumbent Jim Watson. Still, I have to give Mr. Doucet for being the first politician to champion regional rail. It was nice while it lasted. There was a low-key Via Rail visit in Sarnia this past August. Via had planned to make stops in various communities to showcase their service, which provided a great opportunity to re-familiarize myself with rail travel. Via also made this a community-minded event, by holding a ceremony in partnership with Sarnia’s RAIL (Rail Advocacy in Lambton), a grassroots lobby group, whose purpose is to increase and improve the level of train and bus service in Sarnia-Lambton. Via’s staff donated and planted seven trees in Centennial Park, where CN’s lightly-used Point Edward Spur runs through, servicing Sarnia’s harbour and docks. (The last time Via ventured onto this spur was when the Grey Cup Centennial train visited Sarnia in 2015 - Michael). The RAIL group is credited for several improvements in the area. They brought attention to the neglected train station (since restored), and had passenger service reinstated at the Wyoming passenger station. Via’s staff hosted tours in Centennial Park on a rainy summer day. Friendly staff greeted guests, showing off the dome car, a coach car, and a lounge car (Via's Glenfraser). Engine 6454 idled for our event, sporting the 40th livery. This train usually operates the Halifax run, according to the engineer. Waterfront condos are seen in the background, along Sarnia’s Front Street. The staff kept kids busy with the cardboard Via trains I remember getting as a kid in the 1980s. There was an entertainer for them too, making balloon animals and telling jokes. He was a real hit with the kids. In the dome car, a young staffer answered questions and took pictures. I am used to traveling by air, so it was a bit of a surprise to see how dated the coaches are inside. They are clean and in a good state of repair, so it’s not a criticism. I can imagine this is a very nice way to travel, taking in the scenery. Certainly more room than an airline seat. Sarnia’s Historical Society took advantage of this gathering to show off Bullet Nosed Betty, on static display at Centennial Park. 6069 has been under restoration for several years by a dedicated group of volunteers. The gates were open, and guests were allowed to check out the inside. This was the first time in ages that the inside of this steam locomotive was accessible to the public. My son loves checking out trains, so this was a thrill. A rainy day was not stopping him! A CN retiree was on hand to talk about 6069. He was one of the last engineers to operate this old workhorse. He was very kind to my son, and let him wear his hat. He gave us a tour, showing us the basics of steam operation. Thanks to VIA for bringing this tour to Sarnia. It was well attended by kids and adults alike, with politicians mingling in. Note Sarnia Bay and the Government Docks in the background (top left). This spur terminates at the waterfront. 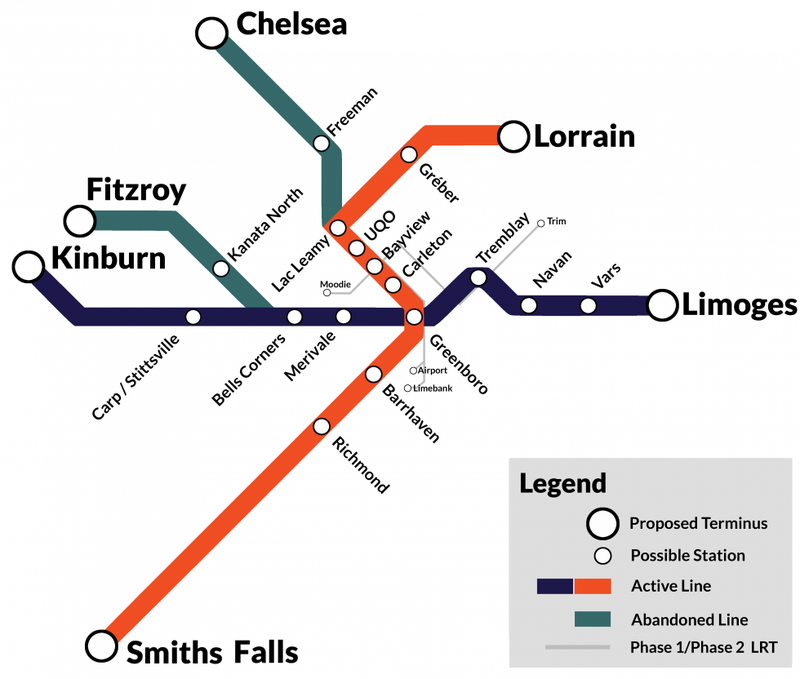 With last week’s rant about the city’s laughable railway rhetoric out of my system, I want to take the time to look at the idea of regional commuter rail in Ottawa. As many locals know and as I shared last week, Clive Doucet, a former city councillor running for mayor, has floated his idea for light rail in the National Capital Region, which takes a page out of the current O-Train plans and also borrows heavily from the Moose playbook. Of course, our current mayor has dismissed Doucet’s plans out of hand, which is unfortunate. I will agree that Doucet’s plans require much more work, but there is so much about his idea that deserves a harder look. It’s a shame no one on the city’s current council, including the mayor, wants to explore anything other than their own vision for commuter rail in this city. So, in the absence of any real analysis from the experts, I present to you my own analysis of Mr. Doucet’s railway plan, from my own point of view. I don’t pretend, of course, to have all the answers. But I would hope I can at least inject a little common sense into this farcical debate. Let’s begin. The plan calls for service to a number of rural communities in the region, connecting Ottawa to many commuters in the east, west, south and north. Many people from outlying areas still drive to work, which is why Highway 417 is jammed every rush hour in both directions. The plan calls for using existing rails, which is such a simple and cost effective idea, I’m surprised it hasn’t even been explored. The plan isn’t an all-or-nothing plan. In other words, it’s not just about building new, electrified light rail lines in stages in the city over the next decade or so. There is a real chance to establish heavy rail commuter trains on existing tracks in short order. The plan calls for a rail link over the Prince of Wales Bridge. The responsibility for the system would likely be shared among municipalities, not just Ottawa. There is a potential to get two provincial governments involved in this project. I know I wrote that in the good column as well, but it’s a double-edged sword. With the current government in Ontario not likely to want to be the steward of another GO Transit system in the province, it’s unlikely the regional rail system here would have the same model as the one in the Greater Toronto Area. Also, with a potential change in government looming in Quebec, who knows what the new government will want to do in the Outaouais region? The area is an anomaly in Quebec for many reasons, including its dependency on the federal government and its voting patterns, which sometimes run contrary to the rest of the province. Critics have estimated that the Prince of Wales Bridge needs $40 million in repairs to prepare it for railway use again. An interprovincial regional commuter service would come under the jurisdiction of the federal government’s Canadian Transportation Agency (read: complications). The plan calls for rail links to areas that no longer have rail lines (Fitzroy Harbour, Chelsea, Quebec, Navan, Stittsville, Kanata North). This is what is left of a line that would serve Fitzroy Harbour on a commuter line. In other words, there is nothing left. This plan would require the repurposing or expropriation of recreational trails, which are jealously guarded in this city. This would not be easy. 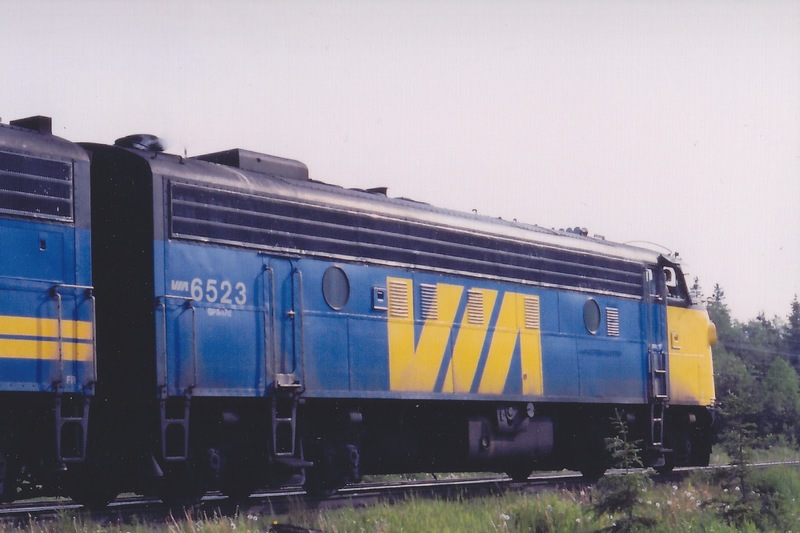 The plan calls for negotiating running rights with Via Rail Canada, Canadian National, a company in Arnprior and municipalities that own former rail rights-of-way. This is because the proposed system would use the Smiths Falls Subdivision (a very busy Via Rail corridor), the Alexandria Subdivision (also a busy Via corridor), the Nylene Canada-owned Renfrew Spur, the former Maniwaki Subdivision and the parts of the old Lachute Subdivision that are under the control of the City of Gatineau. In other words, there are many, many, many moving parts. Can commuter trains share the Smiths Falls Sub (seen here at Cedarview Road) with Via Rail Canada? It would be tricky to say the least, but not impossible. It’s not clear how a heavy rail system would function with the Confederation Line and the Trillium Line. So, with that stated, let’s take a close look at what might be involved if a regional commuter railway was planned and where the trains might operate. It’s obvious from the map that Doucet wants to use parts of the old Beachburg Subdivision to reach Bells Corners and then the old Carleton Place Sub to reach Stittsville. Getting to Bells Corners will require the acquisition of running rights from CN, a publicly traded company. I would imagine this might be trickier than some realize. Although this line is used once a week for the Arnprior turn, I can’t imagine CN would want to do any work on the rails to get them ready for commuter trains. The connection from Bells Corners to Stittsville will require repurposing what is now the Rideau Trail and parts of the Trans Canada Trail, all of which were once the old CP right-of-way. This will be tricky and likely opposed by many people in parts of south Kanata and Stittsville. Doucet’s map shows a connection between Stittsville and Kinburn, which makes no sense since Kinburn is on the old Renfrew Spur and would not likely be part of the Stittsville connection. Another wrench in the works is that the old Bells Junction switch in Bells Corners has been removed and the small spur branching off the Beachburg Sub lifted. That right-of-way has been sold and is slated to make way for a street that will provide access to a new housing development next to a trailer park. This is the last look at Bells Junction, which no longer exists. A plan to use the old Carleton Place Sub for commuter rail would require very tricky land deals. Using the old Beachburg Subdivision to access Merivale Road is a great idea. This section of the subdivision (past Federal) is basically not used with the exception of Wednesday and this area could really benefit from a commuter rail connection. But after passing through Bells Corners, the old Beachburg Subdivision past Nepean Junction is gone. Rebuilding the roadbed all the way to Fitzroy Harbour will be monumentally expensive and likely not worth the effort, since the communities along this old railway line are not large enough to justify such a large capital project. The real benefit to using this old railway would be if it was used to connect Pembroke and Petawawa to Ottawa. But rebuilding this old piece of the CN Northern Transcon is not going to happen. This was a project that should have been explored years ago, before CN cut and run. A more practical approach would be to rebuild the right-of-way into North Kanata, where it could serve the large technology community and subdivisions there. Anything beyond that area would be a sucker’s bet. As mentioned above, this rail line is used once a week for the Arnprior turn. I'm not sure it would fit into Doucet's plan, although I suspect it would since Kinburn is listed as a community to be served by his system. The good news is Nylene Canada, which owns the rails, has already stated in the media that it would be open to finding ways to increase the uses for this rail line. And the land that the rails occupy is owned by the city. This land was bought by the old Region of Ottawa-Carleton for future use as a commuter line. If only that trend had continued. The bad news is, this line would not actually reach Arnprior, where it would be most useful. That's a big oversight in the Doucet plan, in my opinion. The Renfrew Spur (seen here realigned at the old Nepean Junction) might find a willing partner in Nylene Canada, which owns the rails. Using this line to connect the city to Limoges could work, but there are a lot of Via Rail trains and some CN freight trains that would provide significant scheduling difficulties. There’s also the somewhat odd choice of a connection with Navan in Doucet’s plan. This would require new rails to be built so Navan could be connected with Vars, which is on the Alexandria Sub. It should be pointed out that there is a remnant of an old rail line that could connect Navan, but that link would require a trail be repurposed for rail use again, which is a tall task in a city that is spoiled with an abundance of recreational trails. At first glance, it seems as though someone was just pinning communities on a map without much thought as to what rail line is actually available for use. I think the Navan connection would be highly difficult to achieve. The use of the Alexandria Sub would likely require double tracking parts of this right-of-way and significant negotiations with Via Rail. To be honest, I don’t see any incentive for Via in clearing the way for regional commuter trains on this right-of-way. Can commuter trains shares the Alexandria Sub with Via Rail Canada? One candidate for mayor is counting on it. The same can be said for the Smiths Falls Sub. This is a very busy Via Rail line and there would not be much incentive for Via Rail to share this rail line, if it meant any disruption in its service between Ottawa and Toronto. But, on paper, it makes sense to link Barrhaven and Richmond to the downtown on this line. That would get commuter rail to this part of the city much sooner than the current plan to extend the old CP Prescott Subdivision to Riverside South on the existing right-of-way. One potential problem is this rail line doesn’t actually get all that close to the downtown. The closest section would be Pleasant Park, so it would require some creativity to get these commuters into the core. Once again, the plan to extend commuter rail up the Gatineau River Valley would have been a great idea a few years ago, when the municipally owned line was in a state of flux. This line never recovered from a series of wash-outs years ago, which cost the region its unique Hull-Chelsea-Wakefield Steam Train. Just last winter, the last-ditch efforts to get a tourist operations back on the rails on this old line essentially fell flat when the towns along the line began lifting the rails. It’s too bad because, with some work, this line would have been perfect for commuter rail as it was essentially inactive for parts of the year. The one complicating factor to using the old Lachute trackage through Gatineau is that this line is slated to become an important part of that city’s light rail system, which is in the very early planning stages. The tracks have been rebuilt by the city, after they were ripped up to make way for the city’s Rapibus system. So, the line is in good shape. But the questions of clashing plans and interprovincial jurisdiction and funding would likely confuse the process. Commuter trains on this section of the Lachute Sub might find willing partners in Gatineau, depending on the city's own plans for light rail. I find it strange that Doucet's plan does not include the planned extension of the O-Train Trillium Line to Riverside South. This project, which was finally embraced by the current council after years of dithering, would be an important part of any regional commuter system. Better still, there is a corridor beyond Leitrim Road where the old CP Prescott Sub could be extended to reach communities like Manotick Station and Kemptville. Currently, this right-of-way exists as some sort of recreational trail. I think there's a great deal of potential with this old line. So that’s my take. It’s too bad that this wasn’t the starting point of commuter rail discussions years ago, when the city was contemplating what to do beyond the currently operating O-Train on the old Ellwood Subdivision. It seems like elements of this plan could really be useful pieces to the city’s mass transit needs in the future. And here we go again. Most of my fellow Ottawa railfans know the city has once again pushed back the start date of the city’s Confederation Line O-Train service, although some of you out there who don’t live in this city might not know. I’ve tried to avoid too much commentary on this project, since I want to focus this blog on much more than LRT. It gets tiresome, to be honest. Lots of construction, but no trains. Get used to this. That being said, it would be crazy for me not to write about some of the recent developments in this city’s sad, sad history of rail bungling. And let’s be clear. Light rail transit has been bungled here many times. 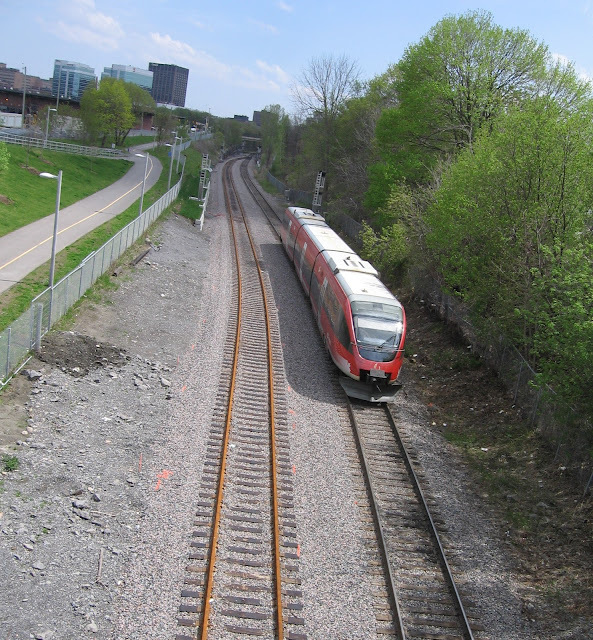 There was a plan under previous Mayor Bob Chiarelli, which once amazingly called for the removal of the existing Trillium Line (former CP Ellwood Subdivision, which is largely buried in a trench and hidden from view in the neighbourhoods it serves). Then there was the fixation with a downtown rail tunnel under Mayor Larry O’Brien, when a surface option was never seriously considered. Let’s not forget the giant sinkhole that collapsed near the O-Train tunnel on Rideau Street and the amazingly absurd insistence that this would not set the project back too far. 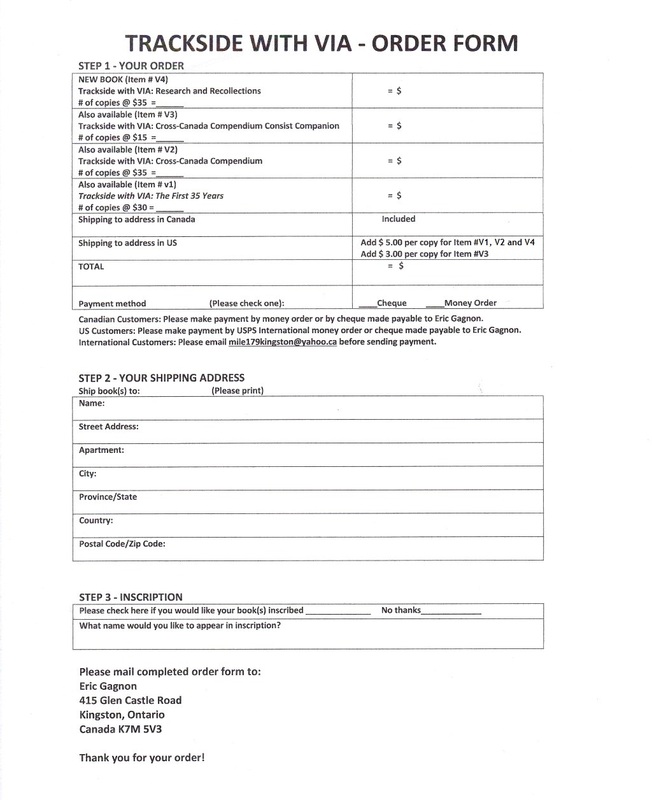 More recently, we have seen the initial April deadline for the beginning of service missed. That was followed by the city letting the Rideau Transit Group off the hook by not insisting on a $1-million late penalty, which was written into the original contract. Now, the Rideau Transit Group is going to miss its own rescheduled deadline of November 2nd. When will service start? We’re being told the first quarter of 2019. West end railway stations are still a long way from being able to host trains. This shot was taken in May, a month after service was to begin. And I’m not even adding in the amazingly myopic decision that the Prince of Wales Bridge would be converted into a recreational pathway. This was very close to becoming reality until the city came under pressure from the Moose group and then the City of Gatineau, which wants to use the bridge as a commuter rail link as part of its own light rail system. You can thank the City of Gatineau and the Moose Consortium for preventing this railway bridge from becoming an underutilized and overly expensive pedestrian bridge. In the coming years, it will host trains and yes, pedestrians. Everyone wins. So, where does that leave us? Well, essentially in a holding pattern. I’m not bothered so much by the delays. This is a massive project and there were unforeseen delays, like the sinkhole. What bothers me is how little information has been shared, even when it is obvious to just about anyone that this project is nowhere near complete. Anyone that lives near the western stations on the Confederation Line knows they are still months away from even being close to ready for trains. I will keep all this mind as the municipal elections approach. I don’t like the way the mayor has handled this file and I worry about Phase 2, as there are already some decisions in place that show an utter lack of understanding of how railways work. So, all this to say, the light rail system has become an election issue, at least for those who know that there is more to the light rail story than the remarkably one-sided stream of “information” that has come from city hall. Add to this drama an interesting twist. A former city councillor, Clive Doucet, is running for mayor. He has once again raised the prospect of using existing rails (what’s left anyway) for commuter rail. That would be a huge boon to my neighbourhood, which has rails running through it that are used twice a week. Mr. Doucet, you may recall, once suggesting running rails down Carling Avenue and was harshly criticized for the idea. Honestly, I thought it had merit. True to Ottawa’s recent history, Mr. Doucet is a day late and a dollar short (to be generous) with this proposal, although I happen to agree with the principle behind it. Mr. Doucet is proposing to run commuter trains to Smiths Falls, Fitzroy Harbour, Kinburn, Chelsea, Navan, Vars, Limoges and Lorrain Avenue in Gatineau, to name but a few proposed destinations. This includes using the Prince of Wales Bridge to connect the O-Train Trillium Line to Hull. Next week, I intend to analyze just what it might take to realize the dream of regional commuter rail in Eastern Ontario. But, let me just say that part of Mr. Doucet’s plan involves commuter rail over scrapped railways including the old Beachburg Subdivision, the former Carleton Place Sub and the old Maniwaki Sub. I would peg Mr. Doucet’s chances of winning the mayor’s chair as slim, but I hope he has at least generated some new enthusiasm for regional commuter rail. It’s at least worth discussing. Right? Anyone? Mr. Mayor? Is this thing on? I finally made it out to the new Canada Science and Technology Museum so I could take in the new railway display. The last time I went to this museum was well before the museum was radically renovated. The steam engine display has always been one of the highlights of this museum, so I was excited to see what the new display looked like. Before I get to my impressions of the exhibit, I have to commend the efforts of the Bytown Rail Society and their efforts to maintain these beautiful old giants. The old steam engines look great in the museum. The work this non-profit group does to keep rail history relevant in Ottawa is inspiring. The new display doesn’t skimp on facts. The old steam locomotives are supported by numerous signs and information displays that put steam technology in its proper context, especially from a technological point of view. The displays really do explain to visitors just how much steam-powered trains served to build this country and drive the economy and innovation. In this respect, the display does an excellent job of educating people. The new signage is sharp and the display as whole has a much more modern feel to it, which seems fitting, given this really is a brand new museum. Just like before, you can sit in the engineer’s chair in one steam locomotive and even play around with some of the valves and levers. The cab also has a fake coal fire burning, which is a nice touch, since it drives home the point that these massive machines were living, breathing monsters. You can also walk into the cab of another locomotive, but the controls and seating are behind a glass display. All in all, this is very much a carryover from the old steam display. My oldest daughter loved being able to sit in an engine and touch all the controls. The display is also supported by a number of railway related artifacts and bric-a-brac. 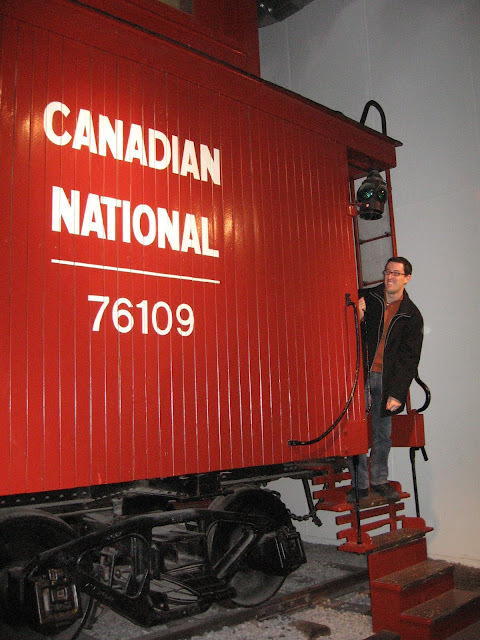 However, I have to say I was a little disappointed that the display no longer features the old Canadian National wood-slat caboose. I think that keeping this in the display and possibly adding a passenger coach, like the coach the Bytown Rail Society has been busy restoring, would have given visitors a much clearer picture of what it was like to travel by rail in the golden era of railways. I also found that some of the signage around the locomotives prevents visitors from taking unobstructed photos of the locomotives. That was a real nuisance for me, although I am probably much pickier than the average visitor. Other than those issues, I was nonetheless impressed with the display. I wonder, though, if having a rail museum in Ottawa might be a better idea than this display. After all, we have a spectacular Museum of Aviation, so why not rail? I think these types of museums appeal to more than just transportation buffs. I mention this because there were a few other rail-themed items in the museum, which I will save for another post. I will also save some more specific information about the locomotives and other items in the display.